My wife had mentioned about making a beer to the baptism. So I asked her what type she wanted, she replied an Amber. We were going to have a large party at my parents house so it seemed a good time to display my brew. 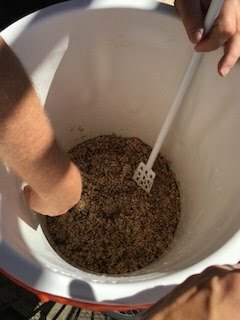 One thing I did learn from the Dark Brown was doing an all grain didn't seem any more work than the partial mash. So I decided to add the extra difficulty of doing an all-grain, on a beer that I was brewing for family and friends. Given this was the first time I was using the mash tun on my own I knew it wasn't the best idea and potentially presenting a lower quality beer, but I went for it anyway. I got the hot liquor tank water up to infusion temp and starting pouring it into the mash tun. I made the mistake of slowing pouring the water in as I kept moving the grains to make sure they did not clump. When I got to my expected 2 gallon in the mash tun, temperature was only 145-150. I wanted 155, so I started warming the water up quickly and poured more in. 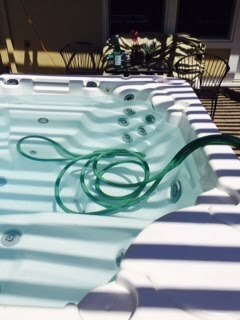 After a 1/2 gallon more water, I had it up to the right temperature. 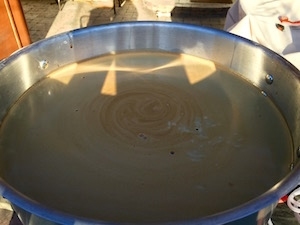 After about a 1/2hr of mashing, I got my sparge ready. This is where I had my second mistake, I forgot the hot liquor tank had cooled and I needed to add more. 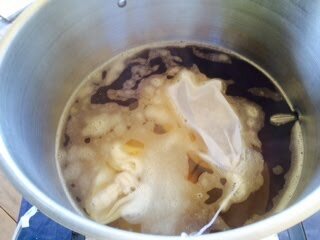 I had quickly heated it up which delayed sparging by 20 minutes. When the water was ready I remembered about prepping the grain bed, I poured a few pints back into the top of the mash tun to get the grain bed filtering clean. I poured a lot more back in than I probably needed to, thinking I wanted the wort clear instead of just free of husks and large particles. 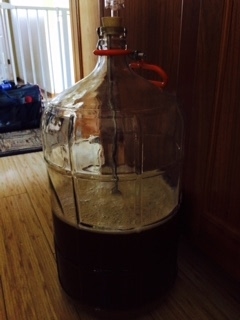 Concerned about the tun getting too cool, I started to sparge. I remembered my friend warning against over sparging and pulling out tannins, so I had that on my mind too. After the sparge was complete I wasn't sure if I left too much sugar in the mash tun as the spent grains tasted a bit sweet. Too many concerns. 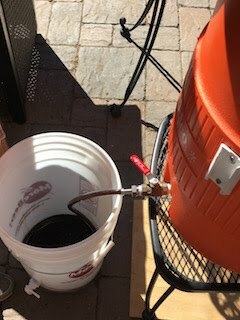 After the boil and cooling I took my OG and found it was 1.062, which was a 1 above the expected, I switched back to being concerned about tannins. I needed to remember the rule of "relax, drink a home-brew". When fermentation was done the final gravity was 3 lower than expected. So I figured I did good. After talking to my friend, the mistakes I made and concerns I had were minor. Longer time or more water in the mash tun are not big problems and only have a marginal effect. 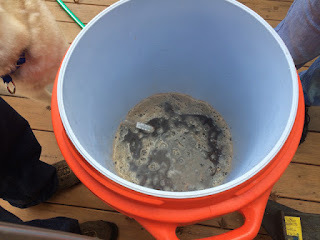 Later I learned more about mash temperature and I suspect the lower temperature extracted more fermentable sugars. The moment of truth came and the beer was good. I served this one and the Dark Brown and the Amber was consumed more. Admittedly the minor tinkering could appear tedious and not dramatic. Some of the pictures look nearly the same. The one advantage to this day was I had a sun shade above which made brewing a lot cooler for me on what was a hot 90F day. 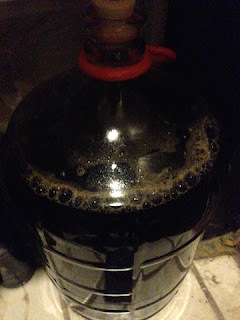 But thus far, this whole brewing journey as been about making minor changes to the recipe and process to see their affects on the flavor, aroma, and physical features to the beer. In the case, I changed the hops and amounts that I used from the Citra APA recipe a week before. The bitterness was raised above the BJCP APA levels to about 54, max is 50. So technically it was an IPA. The recipe, for a 3 gallon batch, added 10 grams of Simcoe and Amarillo hops each at 10 min, 5 mins, and flameout. The Northern Brewer bittering hops was lowered from 18 to 15 grams as I didn't want to overly bitter the beer. In hindsight, that was a useless change and is showing me I'm overly concerned about it. 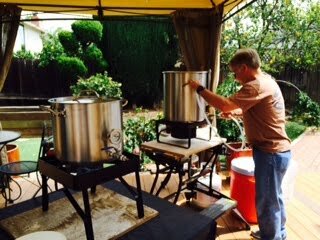 Everything went smooth with this brew process. 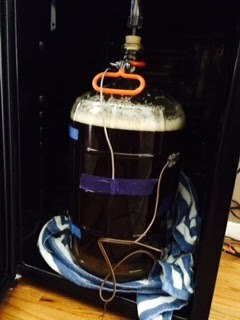 I had no boilover this time, agitated the steeping grain bag a bit easier but still more than C2, and chilling started right away. I took a bit extra care with the process because of my above target gravity last week. 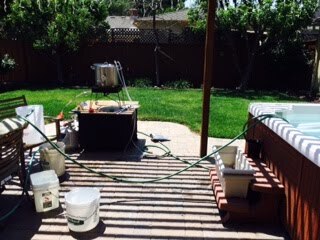 I made sure not to get overly aggressive with the chiller swirling to cool down the wort out of care for the process, not knowing the extra bitterness/DMS that was to come with the Citra APA. The color of the beer was about the same as the Citra APA, but the gravity was 2pts (.002) above target gravity. Not as bad as the 6 from before. However the final gravity came in right at recipe target. 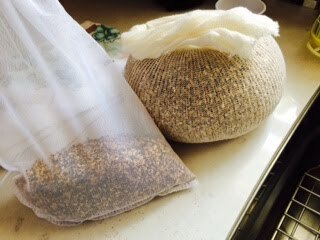 The best I can figure is my agitations of the bag is extracting more sugars out of the steeped grains. In this case, I got more fermentable sugars, hence hitting the final gravity and higher alcohol. 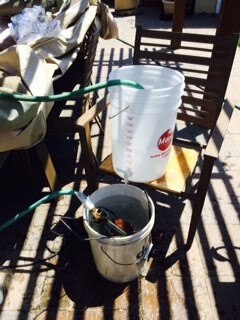 In the case of the Citra APA, my greater agitation must have extracted unfermentable sugars that drove the gravity higher in the final gravity. In the end the aroma and flavor of this beer was good. There was no extra bitterness at all, so no DMS this time. Many commented it was the best one so far. The different hops gave it a different citrus and floral characteristic, which was not hard to imagine since my three previous recipes were Citra-based. But that was the point, to explore a different set of hops. What I did not achieve was a lot of hop flavor given I doubled the amount of hops. As the picture on the left shows, there was a lot of hops that made it through the strainer, far more than previous beers. But I got only a little more flavor. I either have to dump a lot more flavoring hops, or I need to start dry hopping. 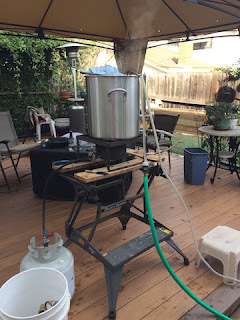 After the Homebrewers conference, it seemed that dry hopping is a standard practice, I guess more than I expected, so maybe I will have to explore that for my next APA/IPA recipe. 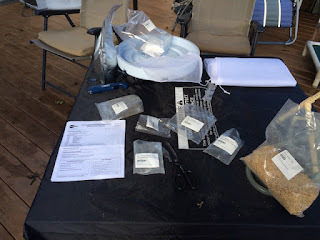 Things I should consider for my next IPA recipe are dry hopping, more bittering, and 6-row.